Getting in shape is not always that easy, especially if you’re not one to go to the gym or run for 5 miles every day. Not all of us are fitness fanatics, but that does not mean we should stay unfit. Mini trampolines provide a fun and easy way for just about anyone to get in shape. Made small enough to fit in just about any room in the home, mini trampolines can help you to work on your cardio, leg muscles, abs, glutes and back. Some mini trampolines are collapsible, meaning they can easily be stored away whilst some have been given added features that allow you to make the most of your workout, and get in great shape. Some mini trampolines are also referred to as ‘rebounders’. Rebounders have been made exactly in the same way as a trampoline has, but they focus a little more on exercise, rather than simply bouncing for fun. Rebounders are usually a little tighter than trampolines, ensuring that you get more of a workout each time you use it. Good quality springs are absolutely essential if you want to use your mini trampoline for many years to come. If you end up buying a product that has poor quality strings, you can be sure that it won’t last for very long. Be prepared to pay that little bit extra for a mini trampoline that has strong strings. Not every mini trampoline can be folded and stored away. If you don’t have much room, or you simply want to put your trampoline away when it’s not being used, then look for those that can be folded and stored. If you are really stuck for space, it may be worth your while measuring how much room you have to spare. Mini trampolines are typically 36 inches in diameter, which means you need at least 40 inches of space available so you can get on the trampoline, and jump with ease. Some mini trampolines aren’t that easy to assemble, even if they have been made to be stored away when they’re not in use. The easier to assemble a trampoline is, the more likely you are to use it. Take a look at the packaging or website description, does it tell you how many people are required to assemble it? If you want to store your mini trampoline some place when it’s not being used, then you should make sure you know how easy it is to assemble. Read some customer reviews as these will indicate how easy a particular mini trampoline is to assemble. Although this may not be the first thing you consider when shopping for a mini trampoline, it is a crucial point to bear in mind. If you plan to place your trampoline on a non-carpeted surface, then you will need to make sure the legs don’t mark the floor as you bounce. Rubber tips on the legs will ensure that your floors do not get damaged while the trampoline is in use. Sometimes you can get a real bargain, but if you want to get the best product for your money. Let’s take a look at 5 of the best mini trampolines on the market right now, so you’re able to decide which trampoline is the right one for you. The Jumpsport fitness trampoline is a serious looking piece of equipment. 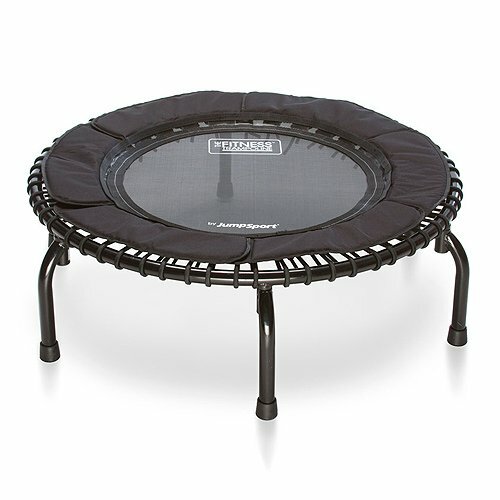 Sold on amazon.com, this trampoline comes with a 39-inch diameter frame, arched legs, and a DVD workout. 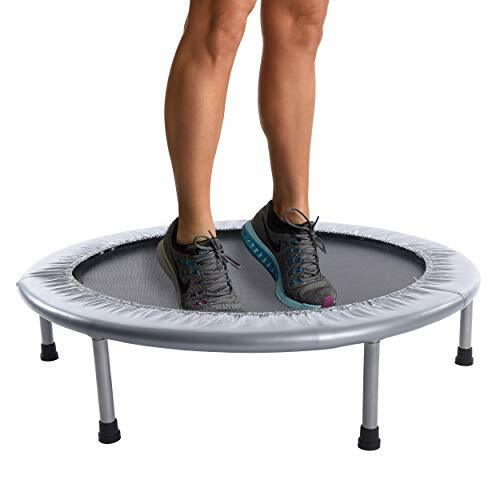 Thanks to the Flexbounce III technology, this mini trampoline allows users to adjust the firmness or the tension of the bounce, which means you can have a more personalized bounce when you work out. The arched legs have been created to ensure that the platform remains a lot more stable, giving you that extra peace of mind you need. When it comes to evaluating this Jumpsport fitness trampoline, it certainly seems to live up to its promises. Customers have commented at being very happy with the cardio workout they get, and the feeling of safety they have when they bounce. There have been some comments about the small jump area, but that may be due to the fact that this product is meant to give your body a specific kind of workout. 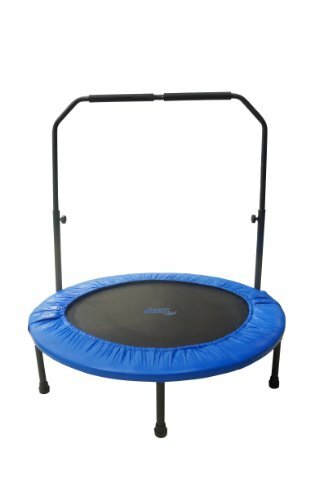 The JumpSport Fitness Trampoline Model 250 is a good all-around mini trampoline that has been made to work well. There doesn’t seem to be much jumping space, which means you may have to be careful how you work out, but with time you will get used to it. With a good reputation and a workout DVD thrown in, this particular trampoline may well be the one for you. The arched legs give you that little more support as you bounce, and they also ensure that the mini trampoline is not affected by the user’s weight when they land. If you’re looking for a good quality trampoline that has a good reputation, then you may want to consider this particular model. The Maximus Pro Rebounder comes with a low impact bounce, and it comes fully assembled. You will also receive a workout DVD that guides you through 4 different levels, and will allow you to work on your rebound technique. Sold on amazon.com, this rebounder has folding legs which make for easy storage. This particular mini trampoline is very popular, thanks to its use in health and leisure centers around the world. Customers have stated that they are very pleased with the way this product works, and the low-impact method of exercising has aided recovery in those with a wide range of medical conditions. Overall, the Maximus Pro Rebounder is a good sturdy product that has a great reputation throughout the world. 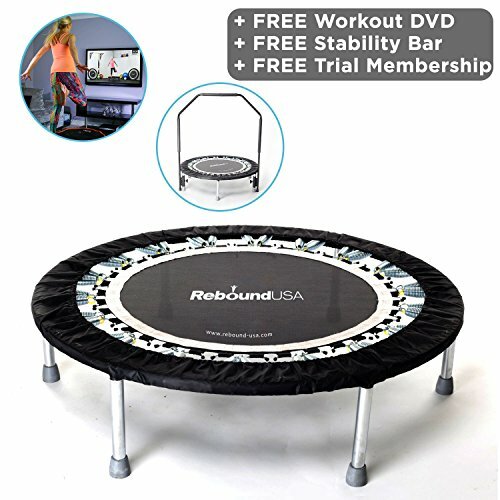 Although this rebounder/mini trampoline is a little pricey, it seems that you get what you pay for, and can expect a high-quality product that will help you get into shape. Be prepared to start off slowly, as this mini trampoline can be quite tough to use. The DVD that comes with the product as standard will guide you through a range of exercises that will help you get in shape. This product is ideal if you’re serious about getting fit, without needing to hit the gym. The Upper Bounce foldable exercise workout trampoline is a good quality mini trampoline that customers seem quite happy with. It seems to do the job that it’s meant to do quite nicely, and although it’s not as technical as some mini trampolines, it still appears to have the desired effect. If you’re looking for a good workout, then this product may be suitable, but as you progress and look for a more challenging workout, you may need to consider purchasing a different mini trampoline. Overall, the MeraxMini foldable exercise workout trampoline is a great piece of home gym equipment for the price, with good customer reviews and an easy storage solution which saves on space. Ideal for use indoors or out, this Gymenist Portable & Foldable Trampoline is very easy to assemble and is ideal for children. Conforming to strict US safety standards, this trampoline is ideal for children from 3 years of age. 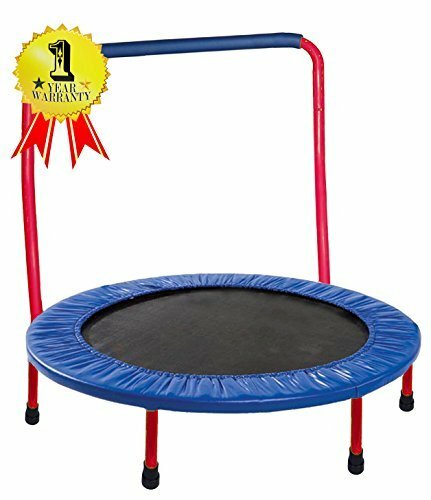 Sold on amazon.com, this mini trampoline will help to improve your children’s motor skills, co-ordination as well as encouraging them to stay active. Sold on amazon.com, this mini trampoline will help to improve your children’s motor skills, co-ordination as well as encouraging them to stay active. The Gymenist Portable & Foldable Trampoline comes with a tubular steel frame, which keeps it strong, and a durable mat, which is ideal for regular use. Customers have stated that the trampoline is easy to assemble, and sturdy, so children can use it with confidence. The Gymenist Portable & Foldable Trampoline is a nicely made product that is ideal for children to use. Although this is not the most expensive mini trampoline around, it seems to be a good sturdy product that has been made with children’s safety features in mind. With a lot of good comments from previous customers, this particular mini trampoline is ideal for kids. This mini trampoline is sold on Amazon, the Stamina 36 inch Folding Trampoline is a relatively cheap model, but that does not mean it isn’t up to scratch. With a heavy duty rebound surface and a strong tension resistance, the mini trampoline is set to impress. The Stamina 36 inch Folding Trampoline is a good quality trampoline that is low in price. With its ability to be folded for easy storage, and great quality rebound surface, this mini trampoline is set to impress. Customers have stated that the trampoline is great for the price, and they can enjoy a good workout. It has been mentioned that it isn’t always easy to add the silver cover, and it may take the patience of 2 people to assemble the trampoline. It has been mentioned that it isn’t always easy to add the silver cover, and it may take the patience of 2 people to assemble the trampoline. The Stamina 36 inch Folding Trampoline is a good trampoline that comes with many impressive features, that will help users to get more out of their workout. Cheap but sturdy, this product is ideal for anyone who doesn’t want to spend a lot of money, but is happy to use a simple trampoline to improve their fitness levels. When it comes to deciding which of the 5 above products are the best, the Maximus Pro Rebounder is the clear winner. Although the JumpSport Fitness Trampoline Model 250 is an impressive model, it does have more downsides than the Maximus Pro Rebounder that is used all over the world, can be folded away and has a great reputation.